The Rev. Patrick Conroy has said he still doesn't know why Ryan asked him to resign. WASHINGTON — Furor grew on Capitol Hill on Friday over Speaker Paul Ryan's decision to oust the chaplain of the House of Representatives, with Democrats and others supportive of the Jesuit priest demanding further answers regarding the speaker's motivation. "He just said that there was dissatisfaction among members with Father Conroy. And that was it," said Rep. Peter King, R-N.Y., after a closed-door conference meeting Friday with House Republicans in which Ryan addressed the Rev. Patrick Conroy's resignation. "I think we deserve more of an explanation on why." King added: "The speaker said it was just because certain people thought he was not compliant with their requests, or not giving good counsel. I never heard that." House Minority Leader Nancy Pelosi, D-Calif., also said Friday she had never received a complaint about Conroy, telling NBC News that Ryan "did a very bad thing" in forcing the House chaplain of the last seven years to resign. Pelosi said that Ryan told lawmakers it was "because the chaplain is not administering to the pastoral needs of the Congress." "It can wait until next year and then have a new chaplain," Pelosi said. "You're touching a very bad nerve here. This is about faith. This is about freedom of speech." Ryan spokeswoman AshLee Strong said Thursday: "The speaker consulted with the minority leader, but the decision (to leave) was (Conroy's). He remains grateful for Father Conroy's service." 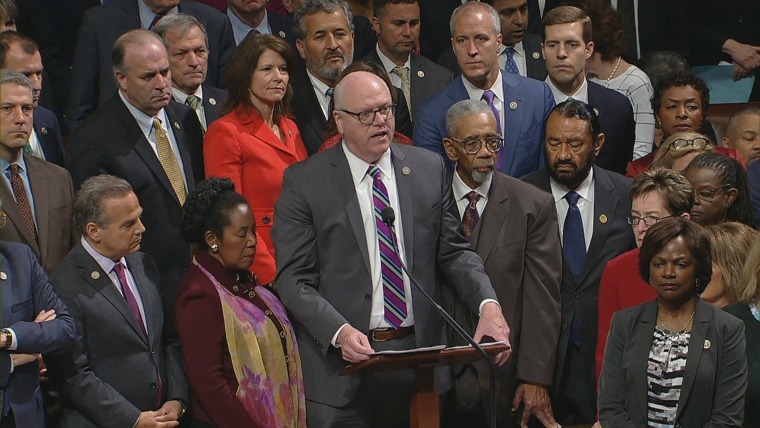 Before the House left Washington Friday for a week-long recess, a large group of House Democrats gathered on the floor of the chamber behind Rep. Joe Crowley, D-N.Y., chairman of the House Democratic Caucus, who offered a resolution that would have set up a select committee to investigate Ryan's motivation for the ouster. Two House Republicans — Reps. Patrick Meehan of Pennsylvania and Tom Reed of New York — stood with the Democrats. Republicans immediately voted to table the resolution. Meanwhile, at least 148 members sent a letter Ryan requesting more information about Conroy's ouster. "The sensitive nature of this situation requires a description of the process followed to arrive at the decision and a justification for that decision," said the letter, spearheaded by Reps. Gerry Connolly, D-Va.; Walter Jones, R-N.C.; Marcy Kaptur, D-Ohio; and Carol Shea Porter, D-N.H. "We believe that, absent such details, questions will inevitably arise about the politicization of the process for hiring and dismissing a House chaplain. Not revealing such details could also risk resurrecting prior questions of religious bias." Kaptur said Ryan didn't have the authority to force out Conroy. "It is not the speaker's prerogative to terminate an officer of the House without a vote of the House," she told reporters. Rep. Mark Walker, R-Ala., chairman of the conservative Republican Study Committee, told reporters he had heard of some members who took issue with Conroy. "I cannot give you any information on what the issue was. The only that we know is that members went to Speaker Ryan with concerns about Father Conroy," he said. Walker, a Baptist minister himself, suggested Friday that he would prefer that the next chaplain have experience ministering to families. "Having spent 16 years in ministry as a pastor, there are things that you are able to understand that families go through in dealing with. It doesn't mean you have to have to have your own," Walker said. On Thursday, Conroy's resignation letter dated April 15 surfaced, which made clear that Ryan had asked him to resign. "I'm very sorry Father Conroy was forced to resign as a House Chaplain. He is a good man. No explanation and no consultation," Rep. Keith Ellison, D-Minn., one of two Muslim members of Congress, tweeted on Friday. Rep. Sean Patrick Maloney, D-N.Y., called it a "shameful anti-Catholic move motivated by conservative extremists in Congress." Conroy, whose last day as chaplain is May 24, said Thursday in an interview with The New York Times that he doesn't know why he was asked to step aside. "I was asked to resign, that is clear," Conroy said, adding that the reason was "unclear." Conroy has been blunt in some of his remarks, including a prayer about the GOP tax bill that he offered on the House floor on Nov. 6, 2017, before the legislation was passed and signed into law by President Donald Trump. Conroy told The Times that a week after the prayer, someone from the Speaker's office came to see him. "A staffer came down and said, 'We are upset with this prayer; you are getting too political'," Conroy said he was told. "It suggests to me that there are members who have talked to him about being upset with that prayer." Later, Conroy said, Ryan told him, "Padre, you just got to stay out of politics." King said Friday that Ryan denied that the tax prayer was the reason for Conroy’s ouster and that it was solely because the chaplain did not provide "good service to the members." Meanwhile, some Republicans defended Ryan. "There were questions about responsiveness," Rep. Doug Lamborn, R-Colo., said about Conroy. "And it just seemed like, like it was time for a change."